CELLINK® gelatin methacrylate (GelMA) is a gelatin-based bioink that provides mammalian cells with the essential properties of their native environment. 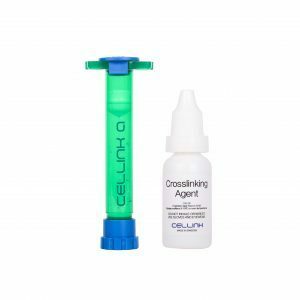 CELLINK® GelMA bioink is modified with methacryloyl groups to crosslink with a photoinitiator (like LAP) or exposure to UV light (available using INKREDIBLE+, BIO X, and a 365 nm or 405 nm photocuring system). Use our CELLMIXER to mix CELLINK® GelMA bioink with a high concentration of cells and enable a one-step bioprinting process. 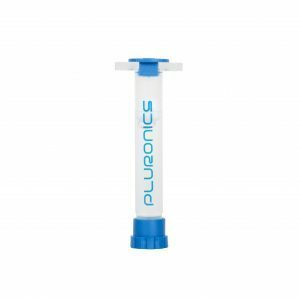 Available with a 0.25 percent LAP photoinitiator. 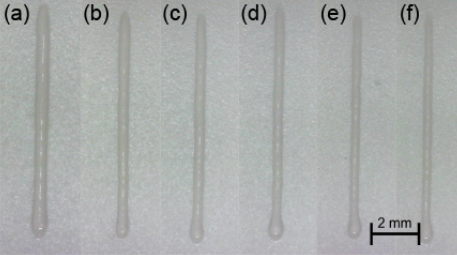 This diagram shows the printability and properties of CELLINK® GelMA, printed with a 27 G conical tip at room temperature (around 23.4° C). The different lines correspond to different printing pressures as indicated by the colors in the legend. Representative diameters of CELLINK® GelMA printed at 20 kPa and increasing translation rates through a 27 G nozzle, representing filaments of CELLINK® GelMA at translation rates of (a) 500, (b) 800, (c) 1100, (d) 1400, (e) 1700, (f) 2000 mm/min.